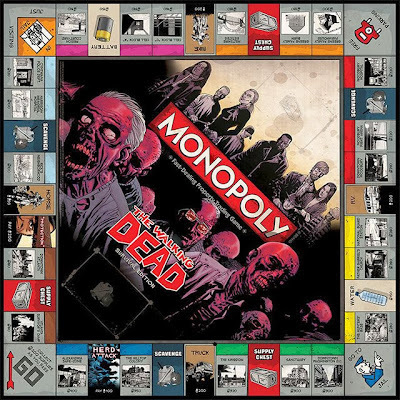 To help point peeps in a not so primary coloured direction, each week leading up to the big day I'm putting other ideas out there, like these official Walking Dead Monopoly and Risk games to make the most of festive board game fun! While I'm not sure 'Go To Jail' is a punishment when the world is full of zombies who want to stuff and eat you like the Christmas Roast, you can't deny their high-carb diet doesn't put a new spin on this traditional name in 'wholesome' family entertainment. Be you the Sheriff's hat or bucket of body parts, remember to watch the banker - money folk are worse than cannibalistic hordes, even on a good day. 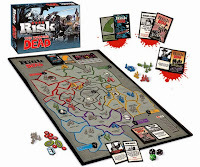 Traditional war strategy game RISK has also been updated in the ways of the flesh, and with each on sale for around $40, they are a finger lickin' good time to be had by all.